An aluminum foam sandwich (AFS), which consists of an aluminum (Al) foam core and two dense metallic face sheets, is a lightweight component material with good energy and sound insulation properties. 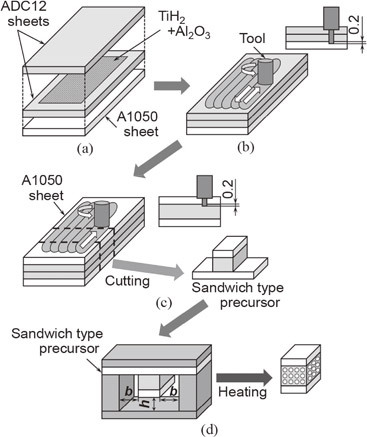 A fabrication method for AFSs that can simultaneously fabricate a foamable precursor and realize metallurgical bonding between the precursor and a dense metallic sheet was proposed using the friction stir welding (FSW) route. In this study, we produced a sandwich-type foamable precursor with two Al face sheets using the FSW route and, by foaming this precursor, an AFS was fabricated. Through X-ray computed tomography inspection of the AFS and observation by an electron probe microanalyzer, it was confirmed that no cracklike pores existed in the Al foam core and that only few pores generated by the foaming entered the Al face sheet. Moreover, static tensile tests of the AFS were carried out, and it was shown that the tensile strength of the Al foam core was not decreased by the existence of an oxide film and that the bonding strength of the interface between the Al foam core and the Al face sheet was higher than the tensile strength of the Al foam core.